The listed prices include shipping in CONUS with tracking. All brushes are in very good to excellent condition unless otherwise noted. If additional pictures are needed, let me know. 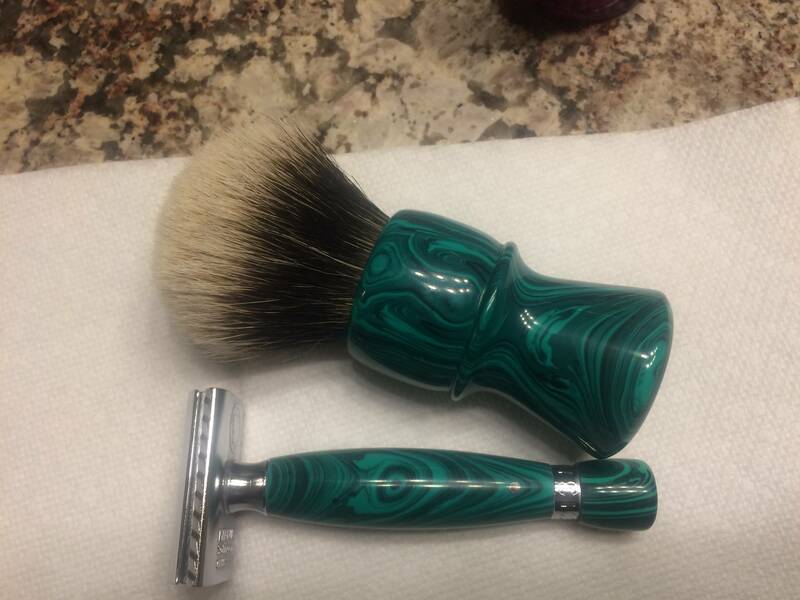 1) Elite Razor Malachite Razor and Brush -- $260. 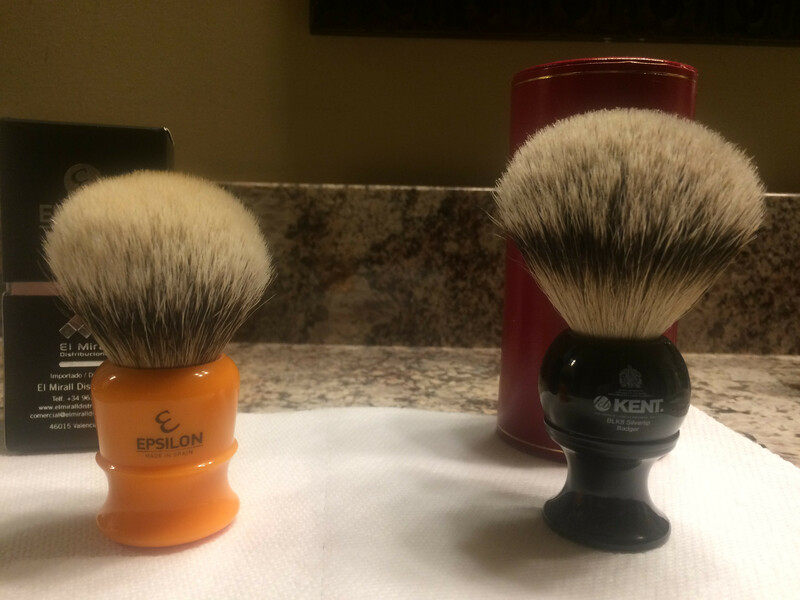 Retail: $180 for the razor and $175 for the brush. This is a long handled progress with custom malachite handle. 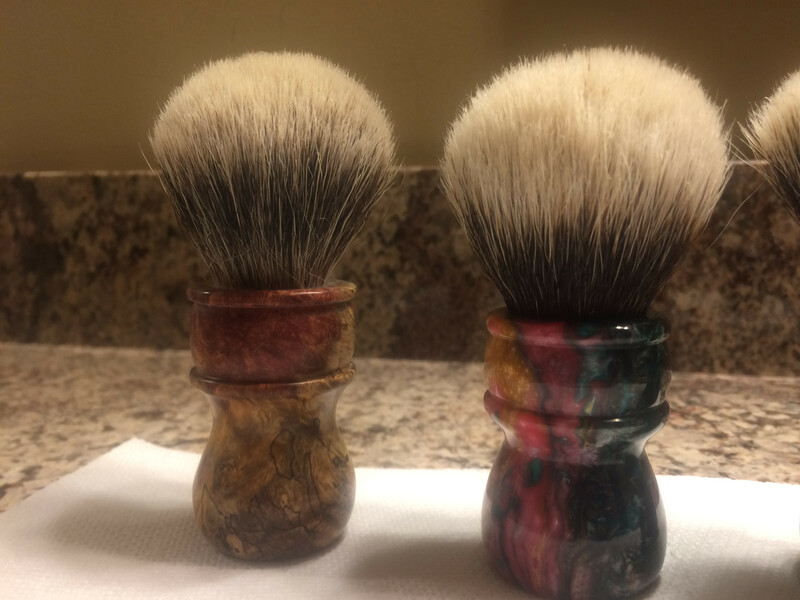 The brush is also malachite with 28 mm 2-band Manchurian. The handle is approximately 60mm tall and the loft is about 53mm. 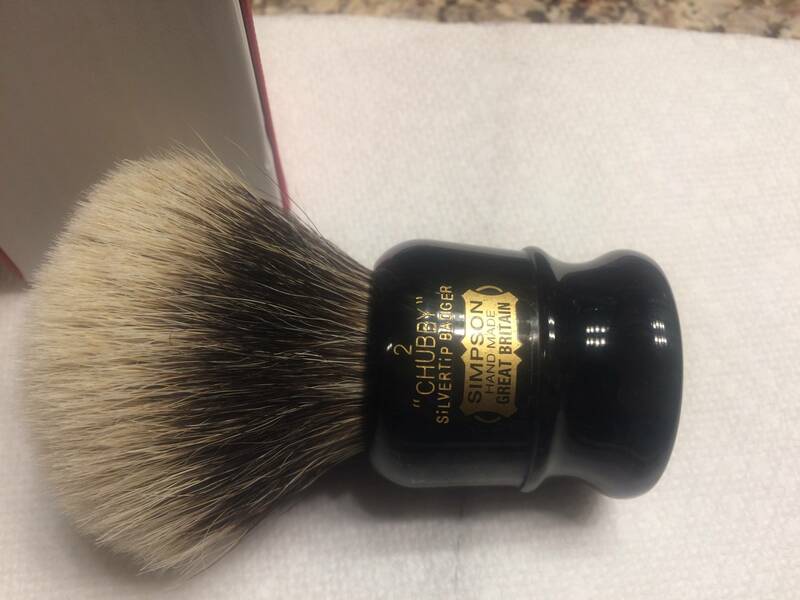 I have decided to keep my other Bob Quinn Progress/brush in gold-laced onyx instead. 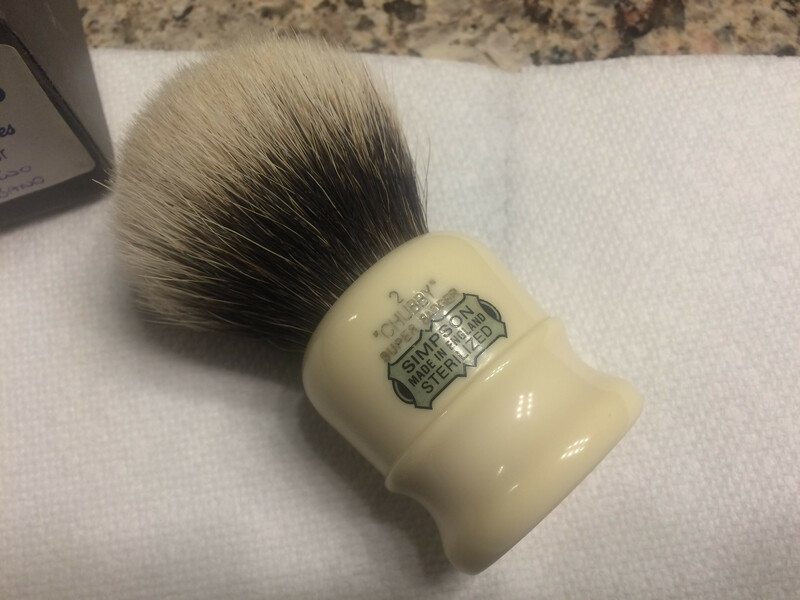 2) SOLD - Semogue horn-handled LE - $150. This was released three or so years ago. The knot is listed as 24mm with loft of 52. I have periodically put horn oil on the handle. 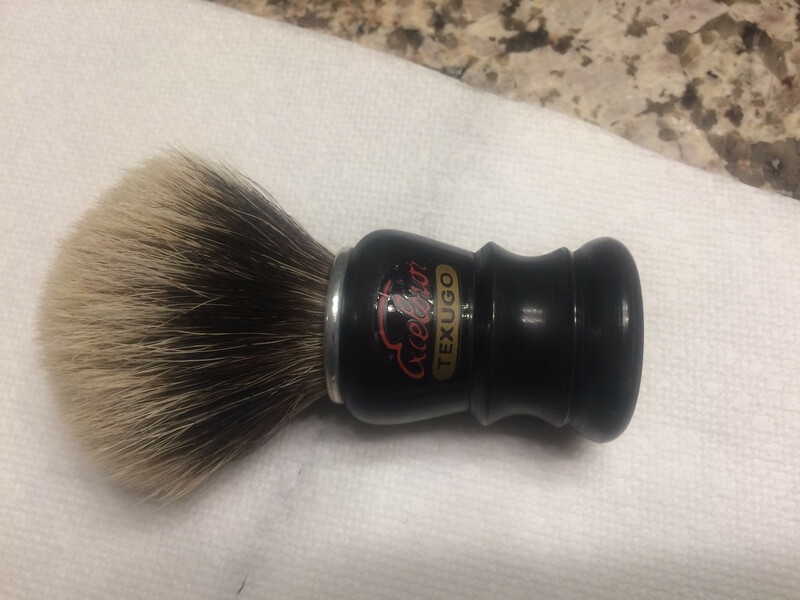 A truly exceptional brush that I will probably regret parting with. 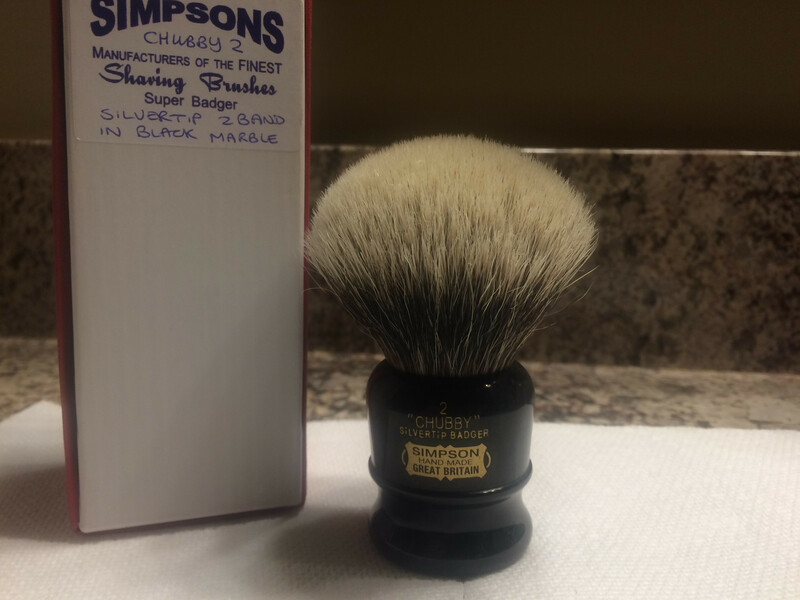 3) SOLD - Simpson Chubby2 two-band Silvertip with black marble handle- $260. 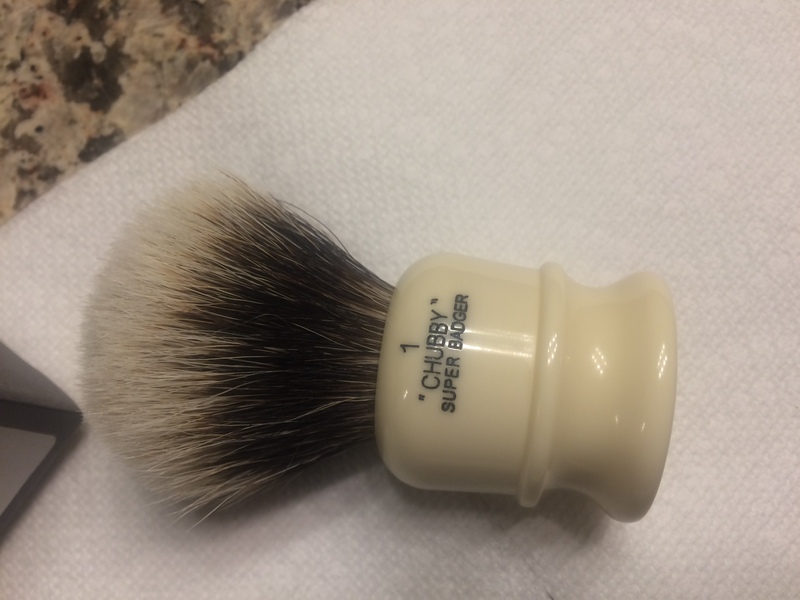 A current Chubby 2 Super lists for $260 at westcoastshaving.com. This is the more difficult to come by 2-band knot. The pics don't really capture the slight color variations in the black marble. 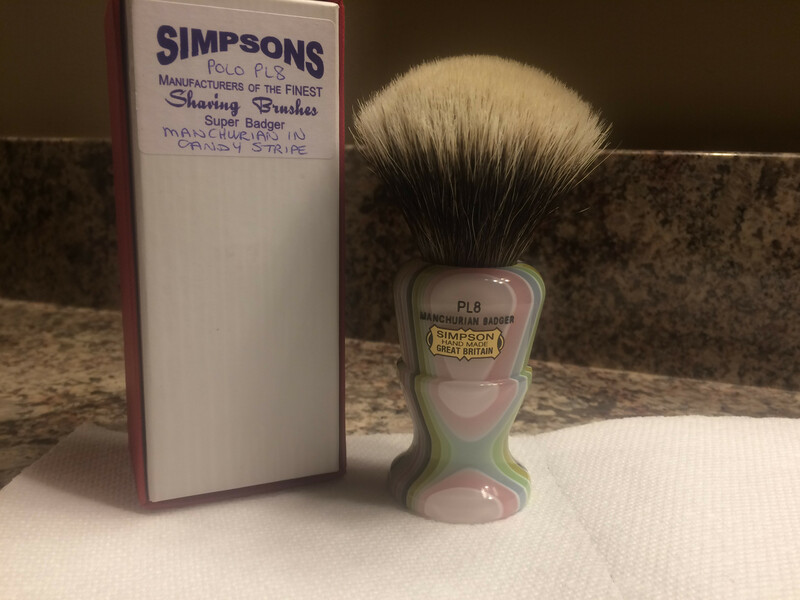 4) SOLD - Simpson Manchurian Polo 8 (candy stripe) - $275. This was over $300 new. 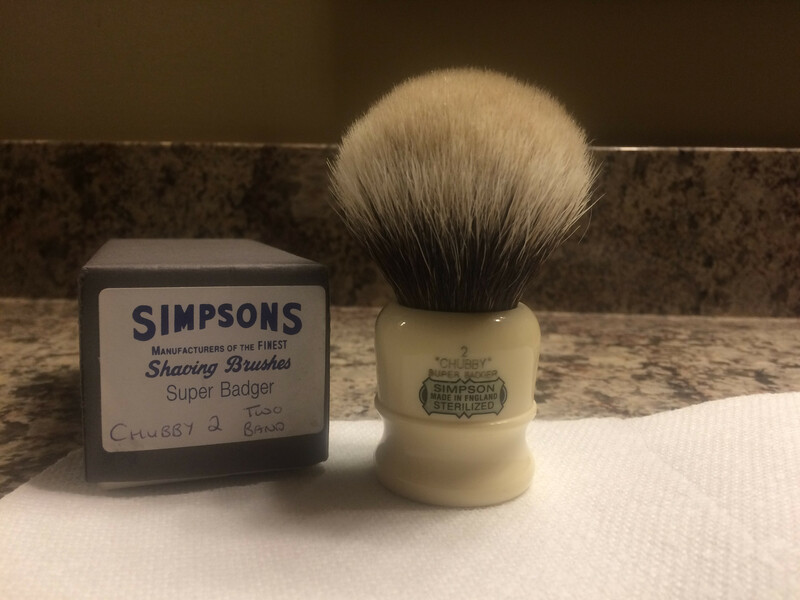 5) Simpson Chubby 1 Super two-band (grey box version) - $215. 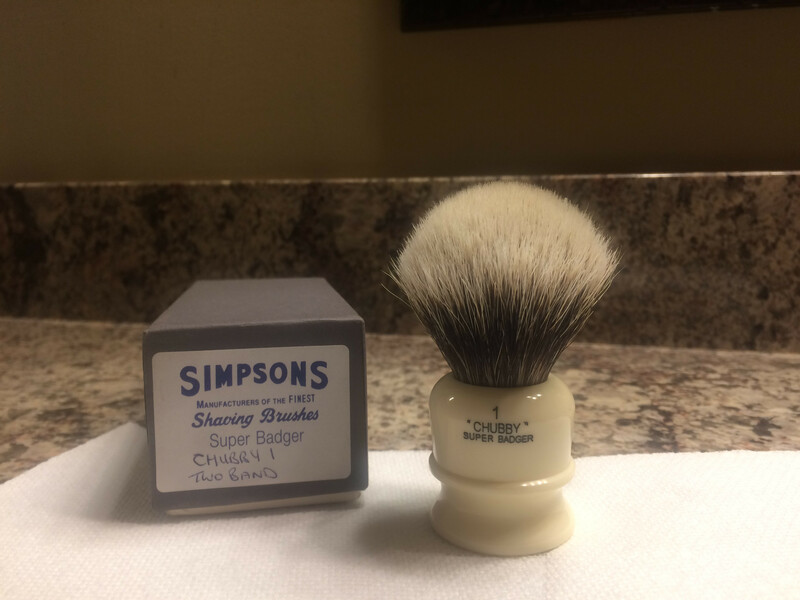 6) SOLD - Simpson Chubby 2 Super two-band - $300 (grey box version). 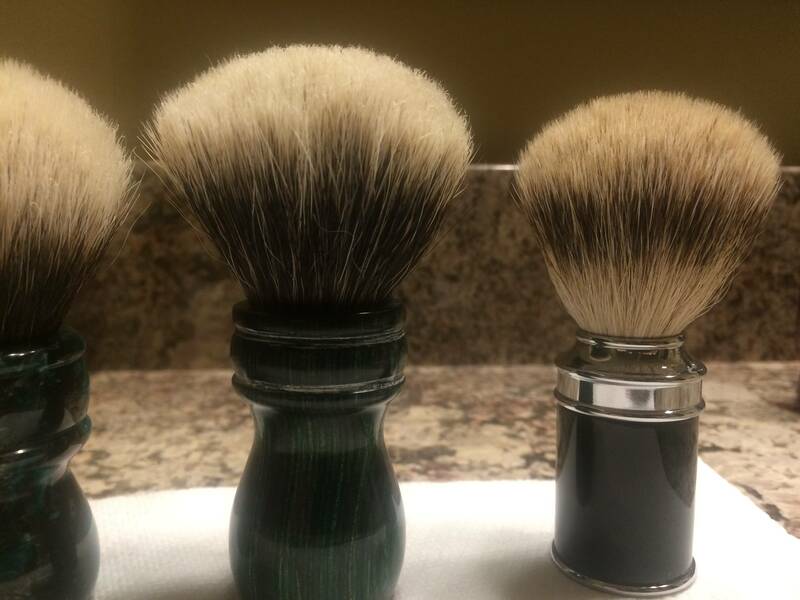 9) The $30 brushes - from left - Elite Razor with TGN Finest knot, LoveYourShave brushes & Muhle brush. 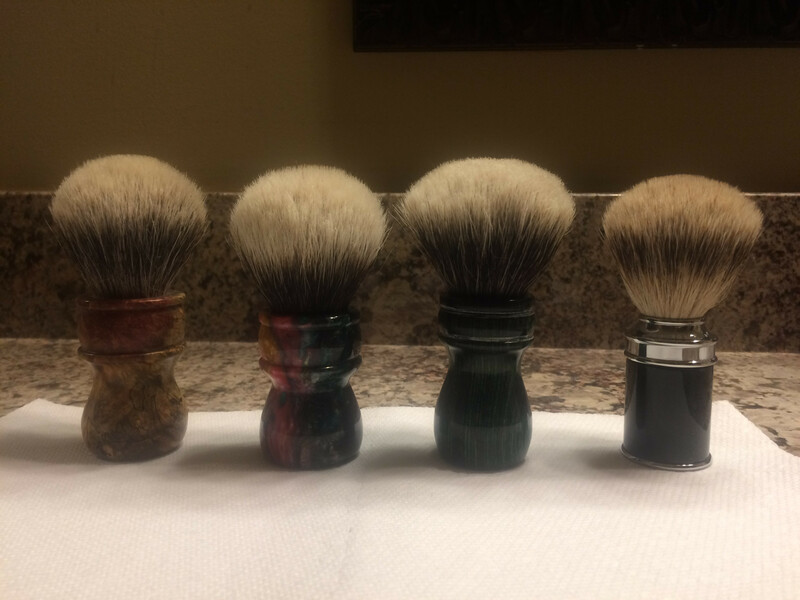 Multi-colored LoveYourShave (2nd from left) is SOLD. 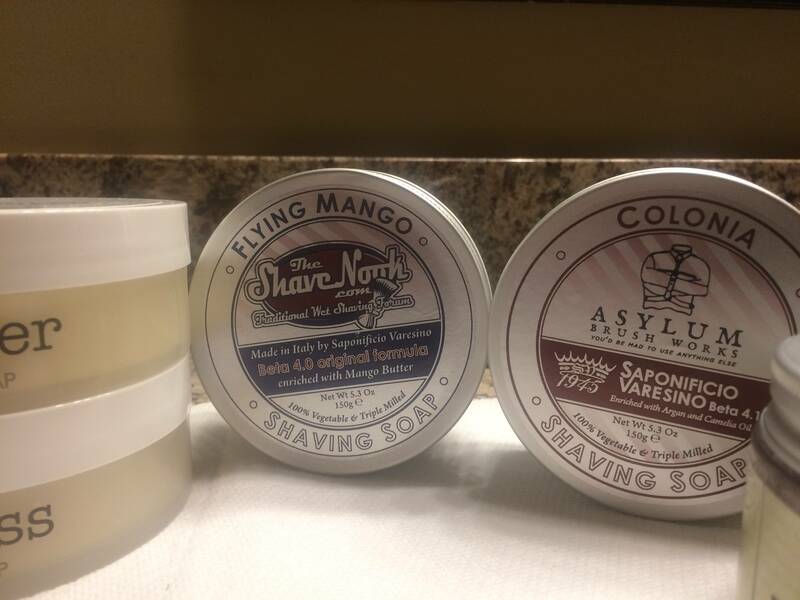 10) And if you made it all the way to the end of the thread -- Soap Lot - $115. Retail is about $170. 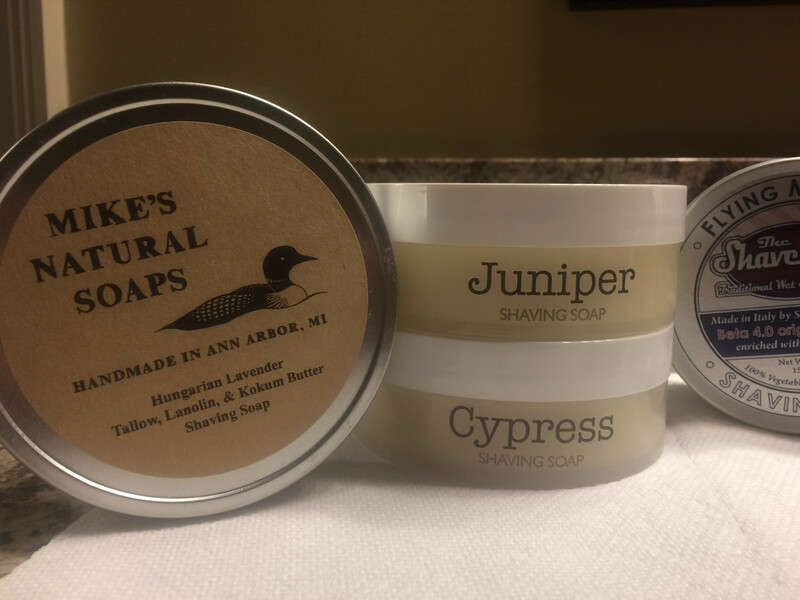 All soaps are new and usused. 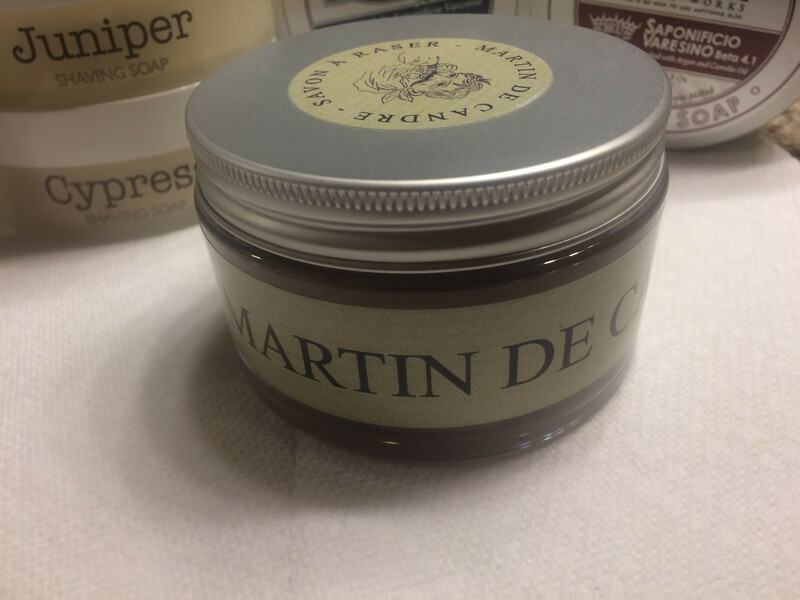 Includes CRSW Juniper and Cypress, SV Flying Mango, SV Colonia, Mike's Hungarian Lavender (has lost some scent) and MDC Fougere. Great offerings. That CH2 will make someone quite happy! 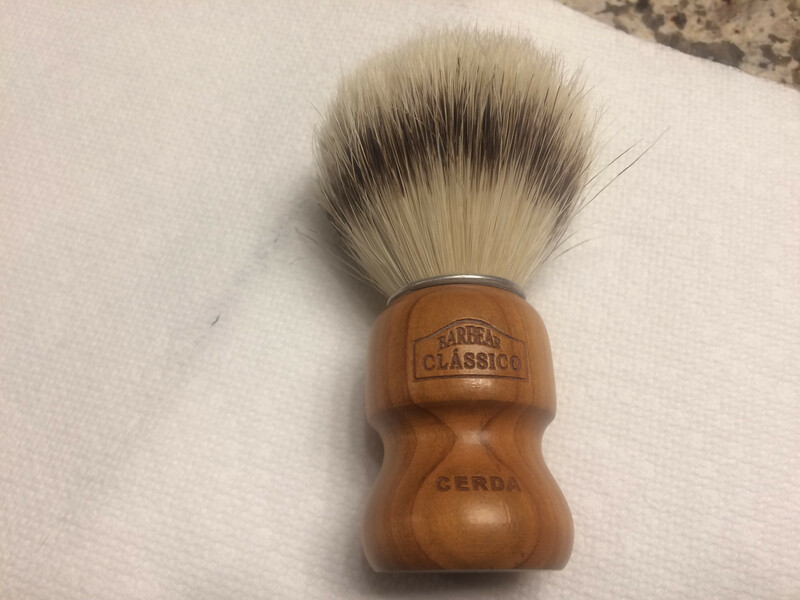 What was the original cost of the Semogue Cerda? Looking it up on vintagescent.com, it was listed at 23 Euros when it was released. (10-24-2017, 08:27 PM)Starkicker Wrote: What was the original cost of the Semogue Cerda? I wasn't sure of the conversion rate when I purchased it. My thought process was about $33 for the brush plus $7 for priority shipping/tracking. If the price is too high let me know. I have that butterscotch Epsilon - it's one of my top brushes. Amazing that someone could have it for $50. Don't hesitate, guys. 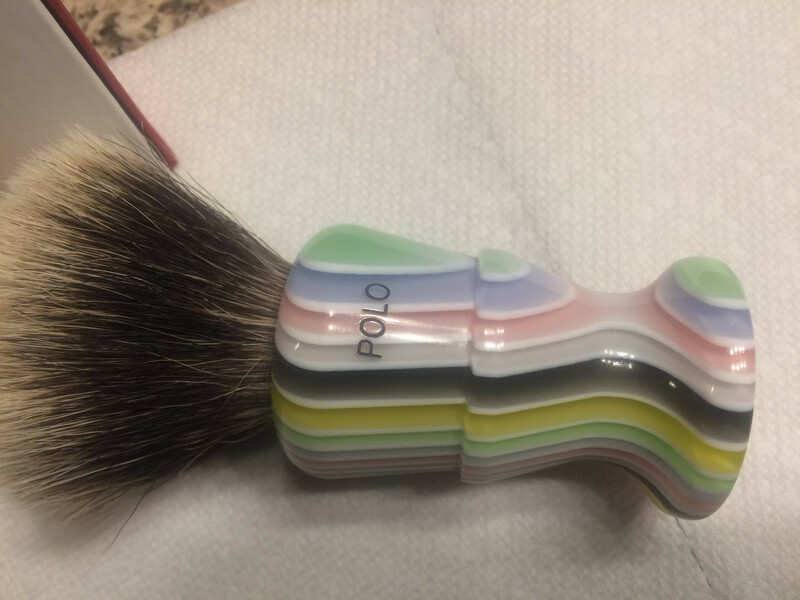 Is that Ch2 Handle genuine marble? (10-25-2017, 08:02 AM)cdude62 Wrote: Is that Ch2 Handle genuine marble? No, it's a resin that Simpson labels as black marble. It actually has some lighter color variations in the handle. As such, the handle is not solid black. My camera did a poor job as it doesn't really show the color variation. That CH2 Super! Oh my! I'm drooling! What a great buy for someone!